Washington evened things up early in the second period as Scott Hannan put home Alex Ovechkin’s pass from the corner at 3:08 — Hannan’s first goal as a Capital. Just over two minutes after Hannan’s goal, however, the Blues jumped back out in front as B.J. Crombeen scored on another odd-man rush. The teams continued their back-and-fourth as Backstrom knocked home a game-tying line-drive up the middle just 1:34 after Crombeen’s goal. For all the scoring early in the frame, goaltenders Ty Conklin and Michal Neuvirth shut the door in the remaining 13:12 of the period as the teams headed to the third noted up. Boudreau had particular praise for Neuvirth. In the final frame, after Brooks Laich poke-checked the puck away from Roman Polak, Alexander Semin picked up the loose puck at center-ice and skated down the wing. Sasha Minor then delivered a perfect pass to Arnott, who put the puck home on the one-timer at 14:41 for his first goal in red, white and blue. It was the second tally of game for the second-line. That’s it. Caps edge Blues, 3-2. With tonight’s victory, the Capitals have back-to-back home wins for the first time since November 26 and November 28 of 2010. For a team who dominated at home all of last year, what could have changed so much? For starters, maybe it’s the Capitals drive at the start of games. Washington, who led the League in first period goals last year, are last in the stat this year. They’ve managed to score just 39 goals in their 65 opening frames this season. Sequences like Steen’s three-on-two goal perfectly illustrate the problem. Both Ovechkin and Backstrom, who had just come on for a shift, lazily back-checked into the defensive zone, assuming someone else was covering Steen. Instead of hustling back into the play, both players glided along the ice and watched as Steen buried a one-timer past a helpless Neuvirth. Bruce Boudreau’s reaction? FURIOUSNESS. Hannan continued his stellar play tonight, blocking four shots in 21:37 of time on ice. His goal was the first Caps marker by a defenseman in 18 games. It was also Hannan’s first goal in 118 games but you wouldn’t have known it by the way he celebrated. 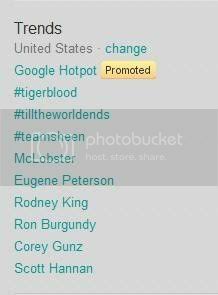 He even trended on Twitter in U.S. midway through the second period. Nice catch, @DaveZeile09. Look at these rights! In the most one-sided fight of Bradley’s career, Strachan utilized the rarely used turn-your-back-to-your-combatant move and lost. Big Time. In regards to his actual play, Bradley also had a very solid all-around game, logging three shots, three hits, two takeaways along with one blocked shot. The Capitals new third line, or “The Marc Line™” as we like to call it, is so fast that no one can actually defend them except for themselves. If Mark (Jason Chimera’s new adopted first name), Marco, or Marcus had hands made out of anything but stone, the trio would have collected three goals alone. Neuvirth now has 21 wins this season, good for a team record for wins by a rookie netminder. Is it too late for him to be added to the Calder Trophy discussion? Washington has now won both their match-ups since the trade deadline, closing the gap on Southeast Division leader Tampa Bay — who they face-off against on Monday — to a single point. “It is good for our confidence,” said Backstrom. The Capitals face-off against the Panthers in sunny South Florida Sunday night. We’ll be here. Will you?